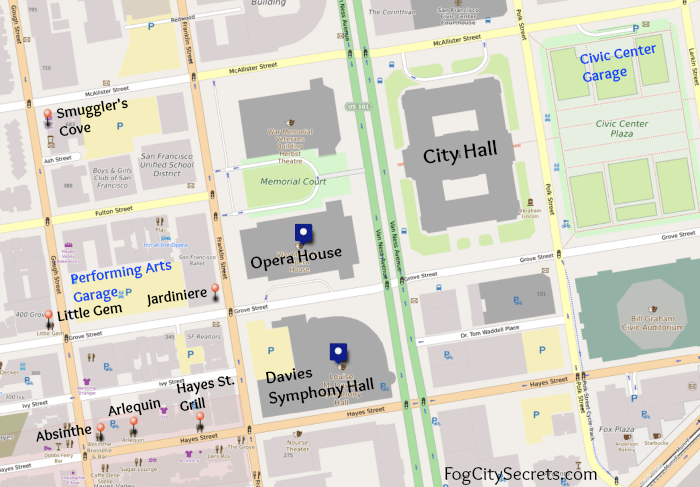 San Francisco Maps. 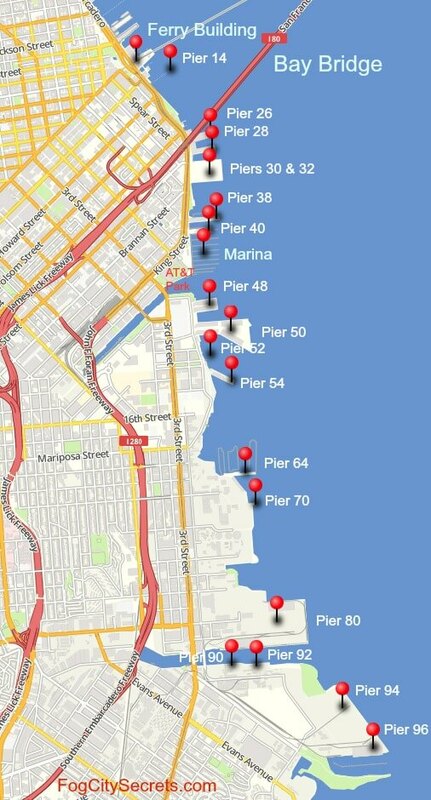 See the ones I've created for SF hot spots. 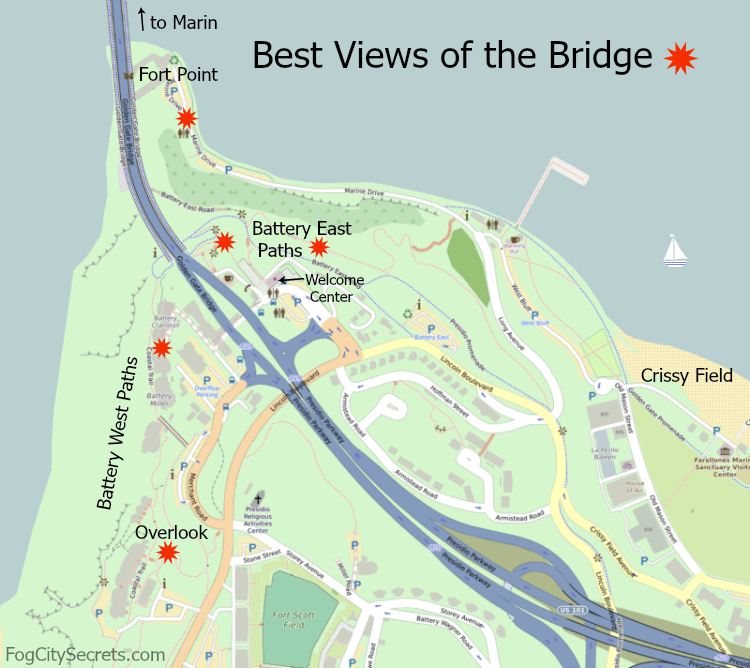 Here's a collection of San Francisco maps that I've created, covering some popular San Francisco locations. 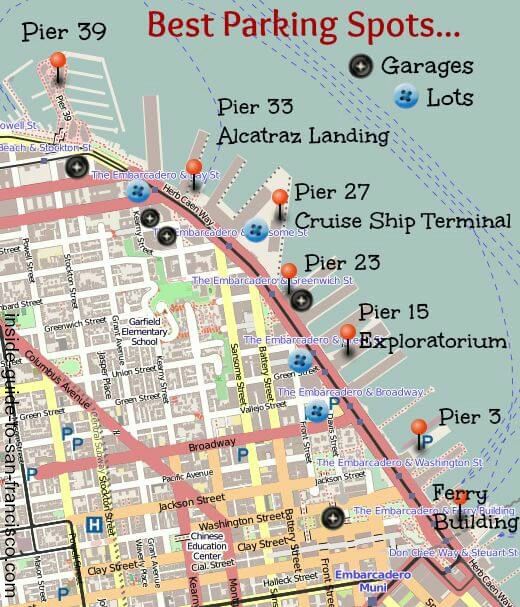 I've marked various San Francisco attractions and points of interest, plus transportation and parking tips. 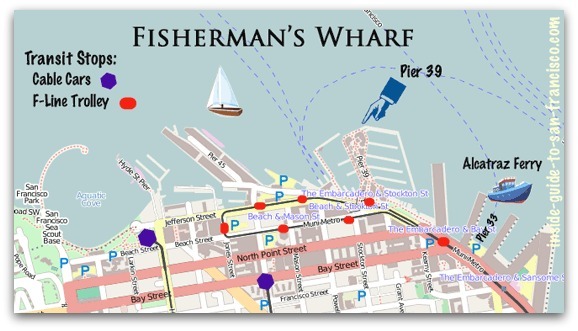 Below, the maps show ways of getting to Fisherman's Wharf by public transportation. 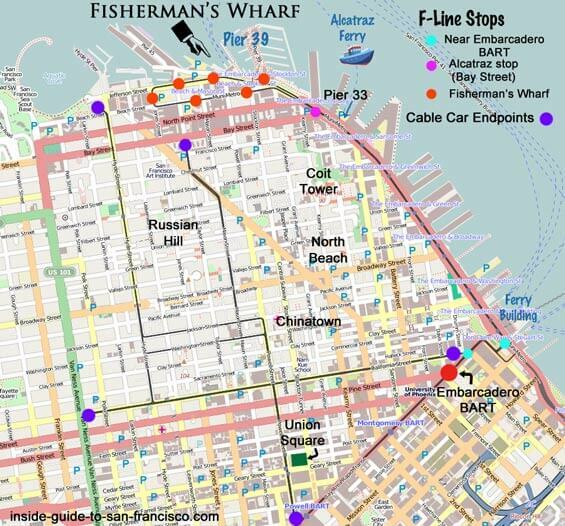 The F-Line street cars run all the way down Market Street, then turn left on Embarcadero Street, and travel all the way to Fisherman's Wharf. 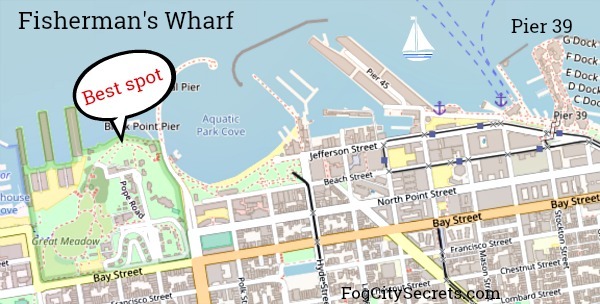 Two cable car lines, the Powell-Mason and Powell-Hyde, leave from Powell and Market and end within a couple of blocks of Fisherman's Wharf. Taking BART? 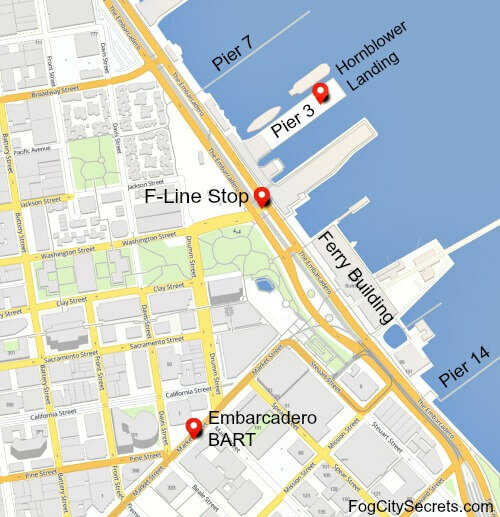 Get off at the Embarcadero Station, then get the F-Line right there and ride it to the Wharf. 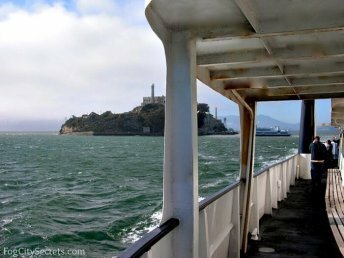 The Alcatraz Ferry leaves from Pier 33 (the Bay Street stop, near Pier 35). 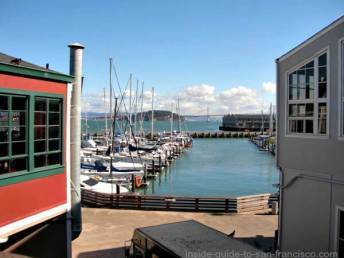 For more info, see Fisherman's Wharf. 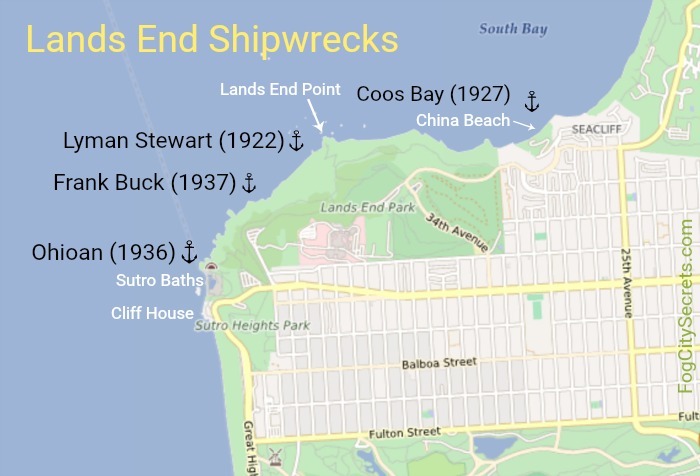 See the Guide to the Piers...items of interest located at the San Francisco piers. 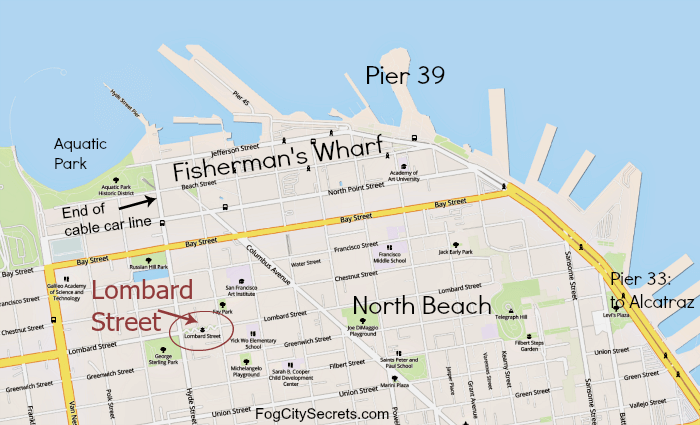 See maps, photos and information about the best parking lots and garages in the Embarcadero area. 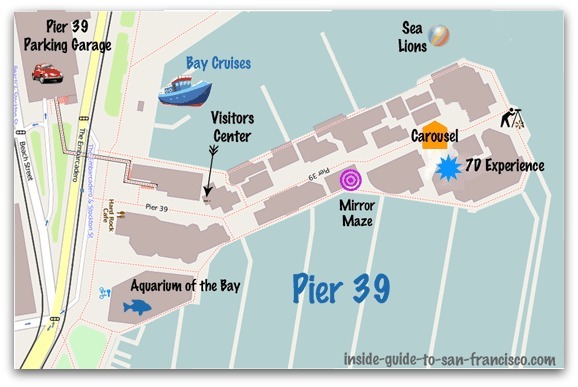 Read about the attractions at Pier 39. 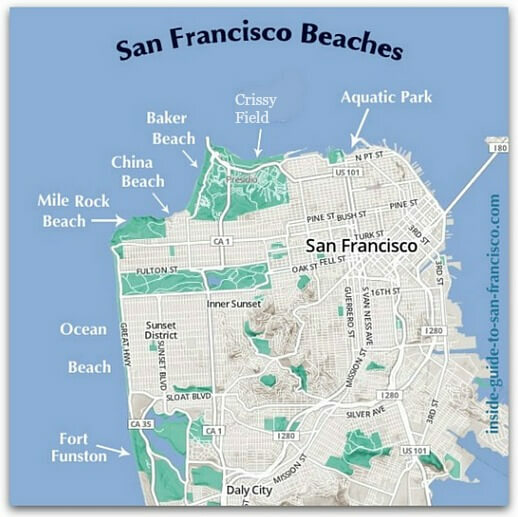 See photos and information and about the San Francisco beaches. 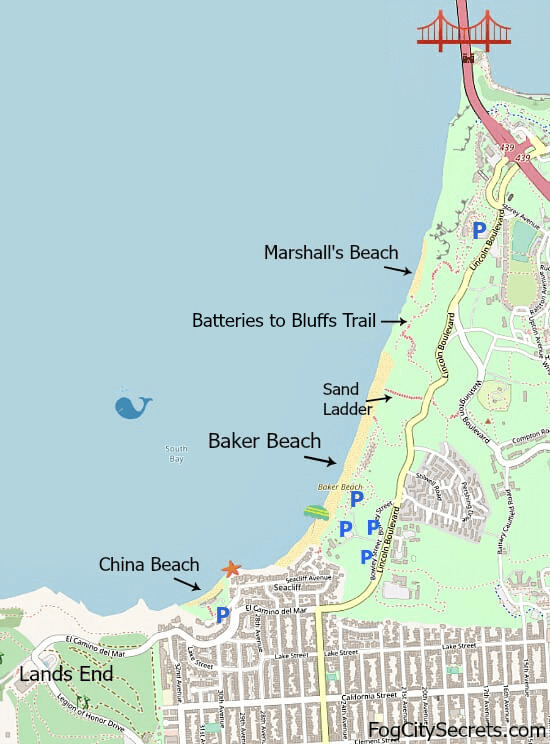 See tips on visiting Baker Beach, China Beach, and Marshall's Beach. 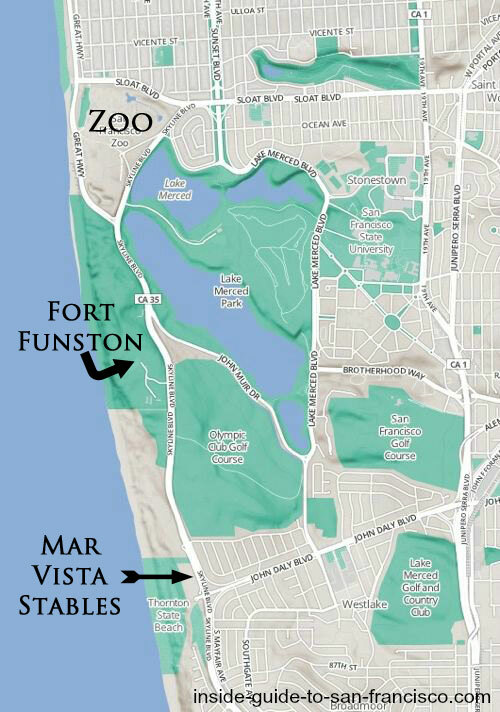 See photos and information and about Fort Funston. 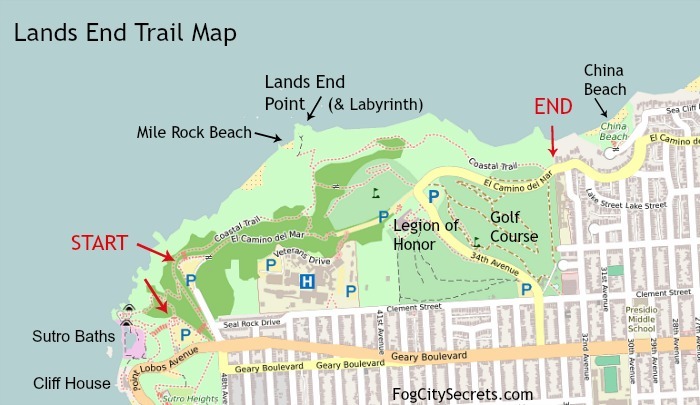 For everything you've ever wanted to know about the park, see my Golden Gate Park guide. See my page on Gardens of Golden Gate Park for more info and photos. 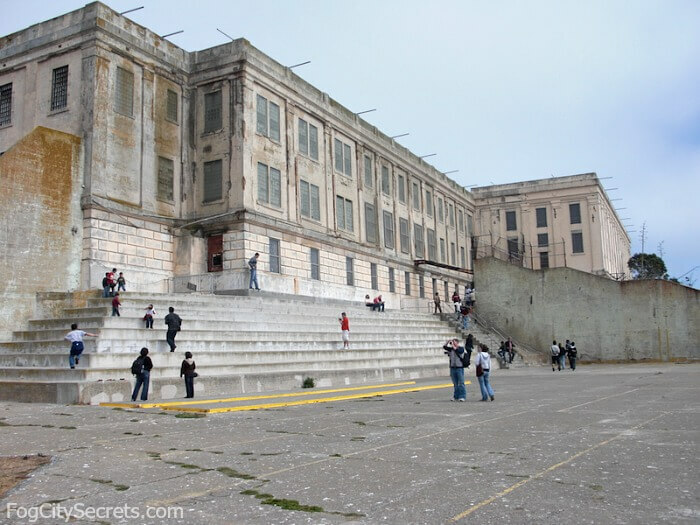 Lots of fun things to do in Golden Gate Park! Visit the California Academy of Sciences or the de Young Museum, go boating on Stow Lake, or relax in the Japanese Tea Garden. 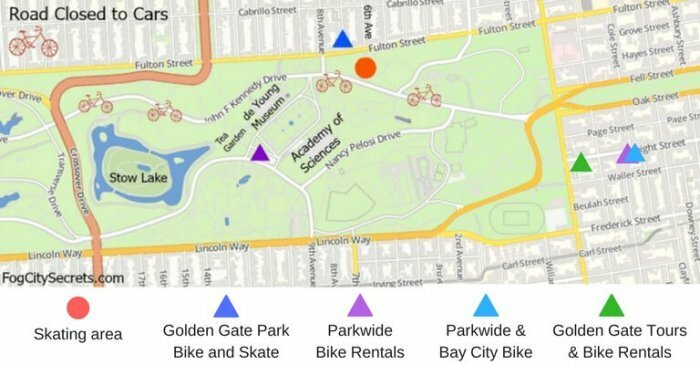 Explore the Conservatory of Flowers, the Botanical Gardens (Arboretum), play a round of disc golf, or do archery at the range. 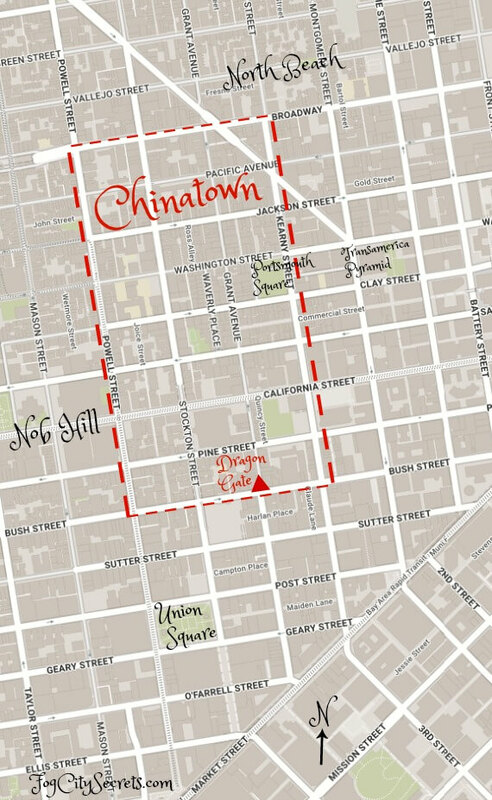 See my Guide to Chinatown, plus more info on shopping, eating, tours and history of the neighborhood. 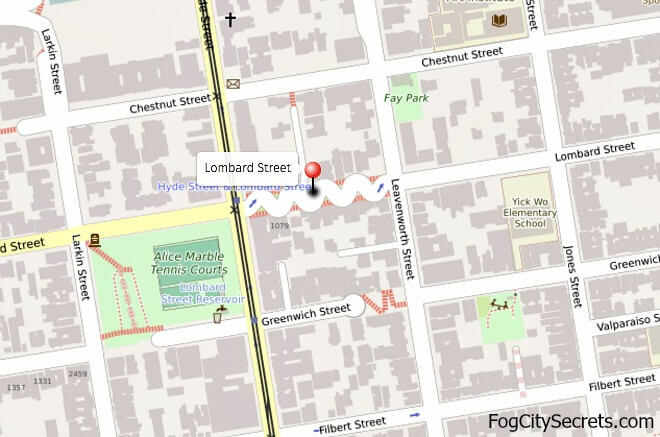 For info on the history and tips for visiting, see Lombard Street. 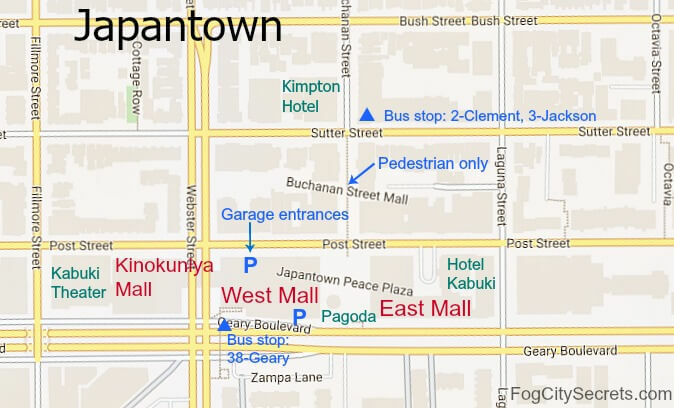 For things to see and do there, eating, shopping and entertainment, see Japantown. 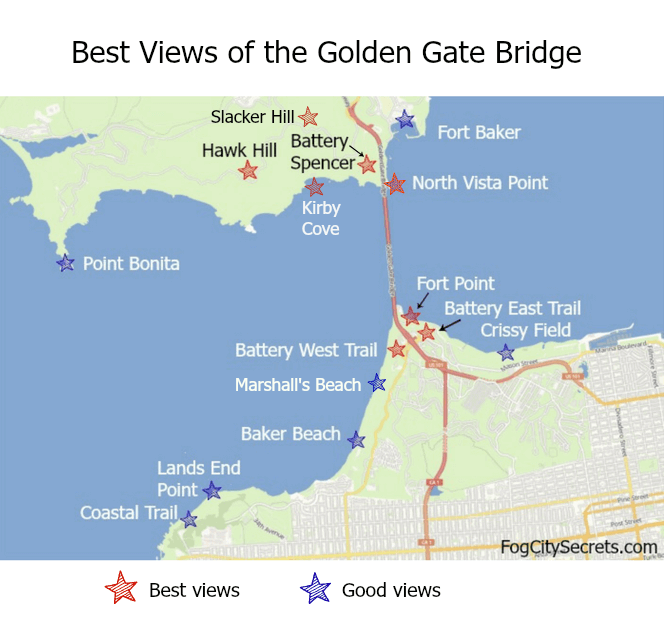 See Golden Gate Bridge views for information on the best places to take pictures of the Golden Gate Bridge: how to find them, how to get there, and where to park. 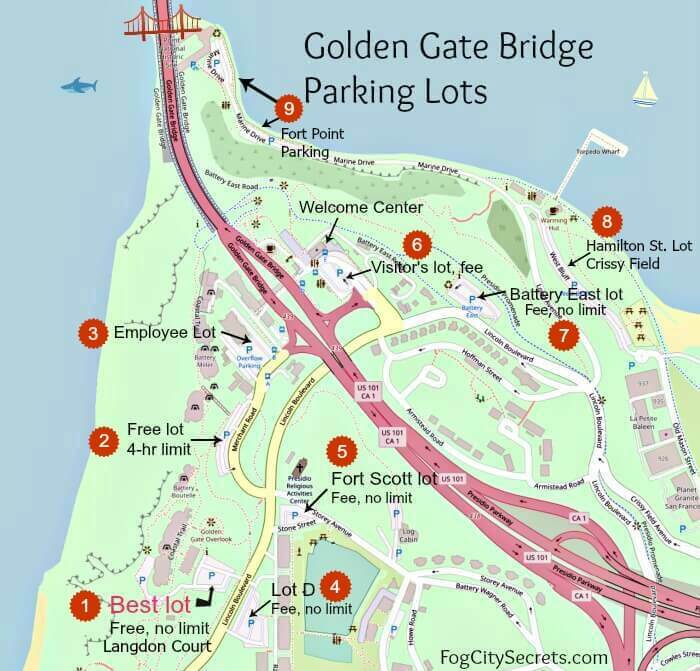 For information on each of the parking lots near the bridge, see Golden Gate Bridge parking. 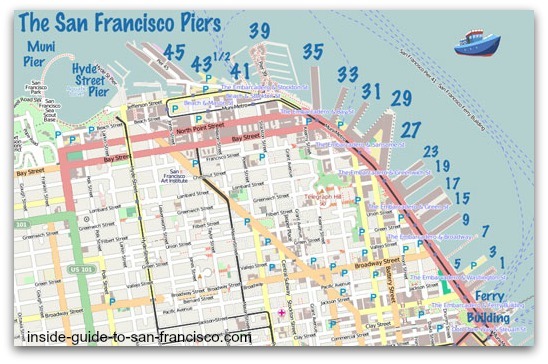 For the series of maps showing the bike route from Fisherman's Wharf to the bridge, see SF bike maps. 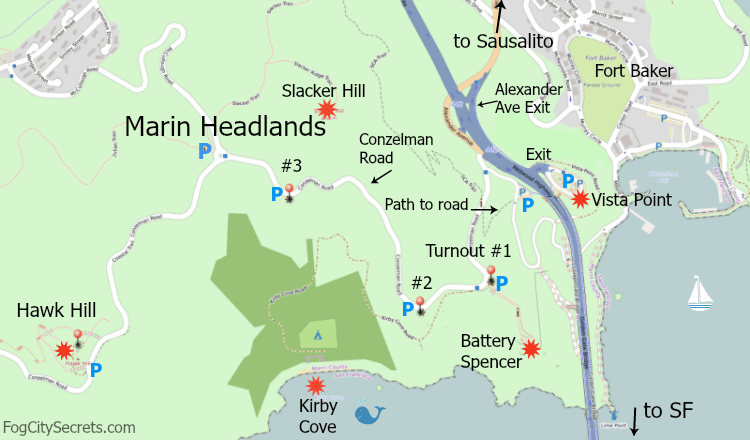 Below is the bike route from the northern end of the bridge to Sausalito. 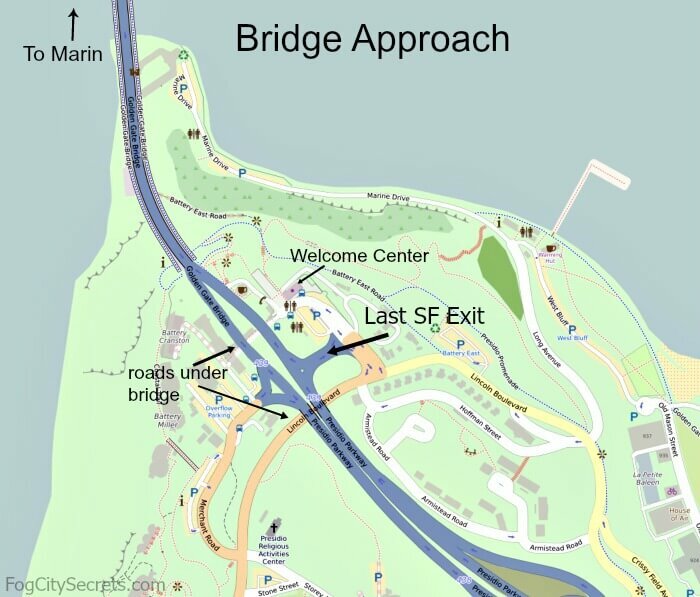 For tips on riding a bike across the Golden Gate Bridge and down into Sausalito, plus maps of the entire route, see biking the bridge. 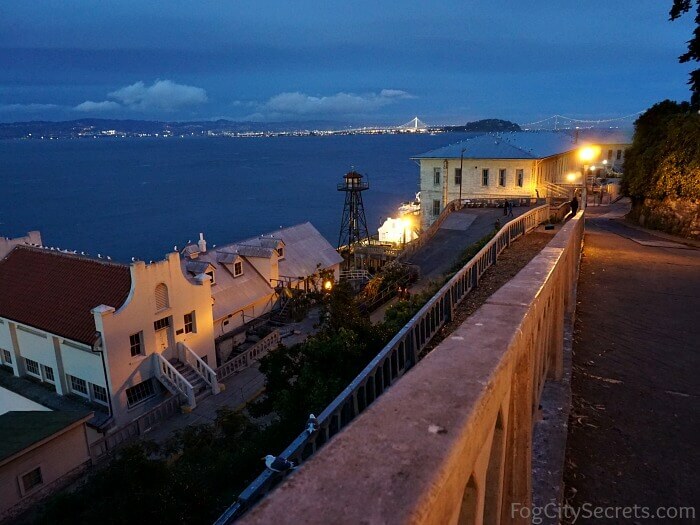 See tips on watching the Blue Angels, what to do during SF Fleet Week, and going on the ship tours. 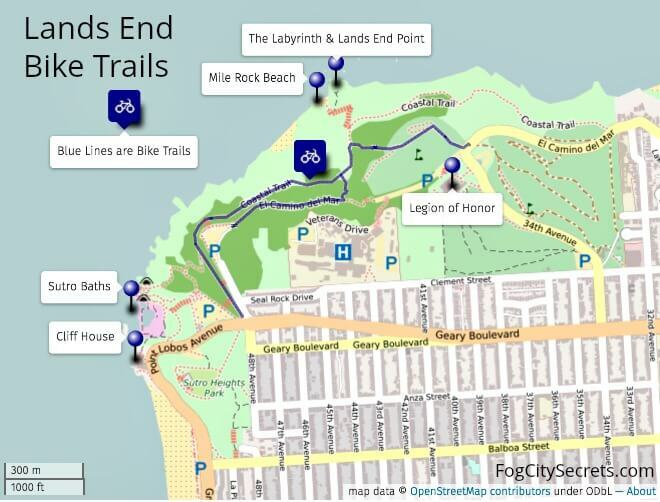 See info on the beautiful Lands End Trail, plus the Legion of Honor Museum. 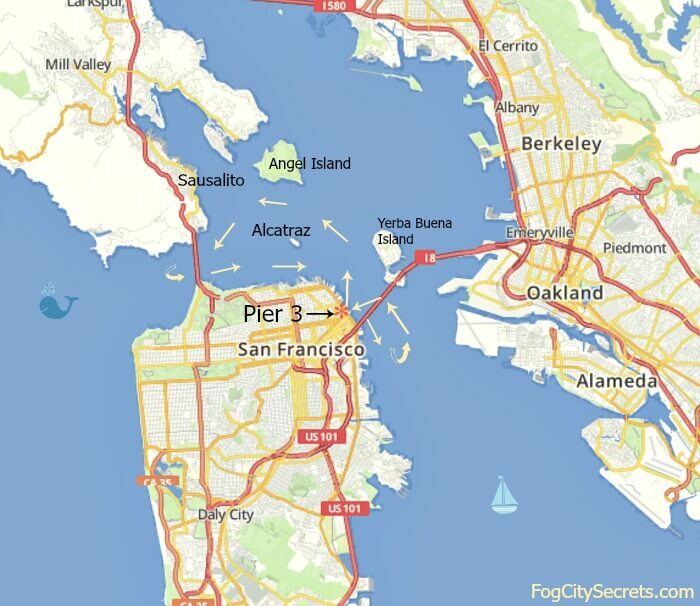 Take a boat around the bay and under the Golden Gate Bridge, or maybe to Sausalito. 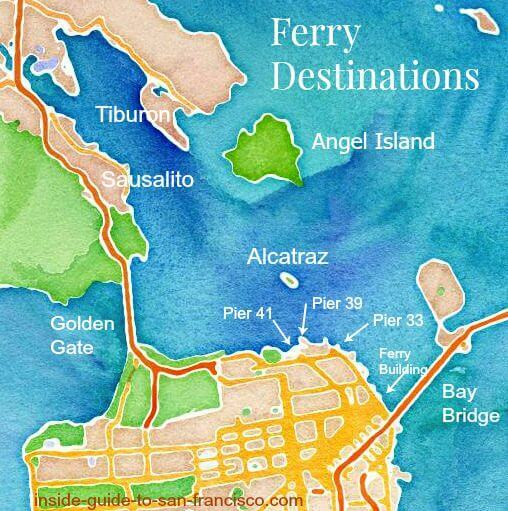 Read about the best bay cruises to take, and where to catch the boats. One of the best SF Bay cruises is the Hornblower dinner/dance cruise. See photos and more info on it. 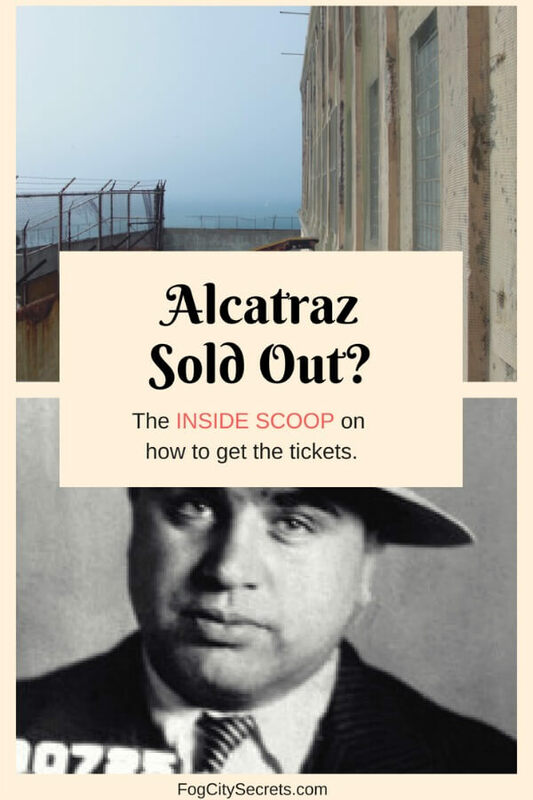 See info on a night out at the San Francisco Opera. 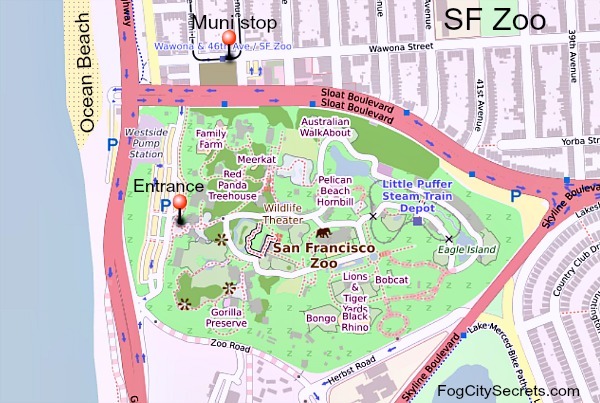 Check out the animals at the San Francisco Zoo. 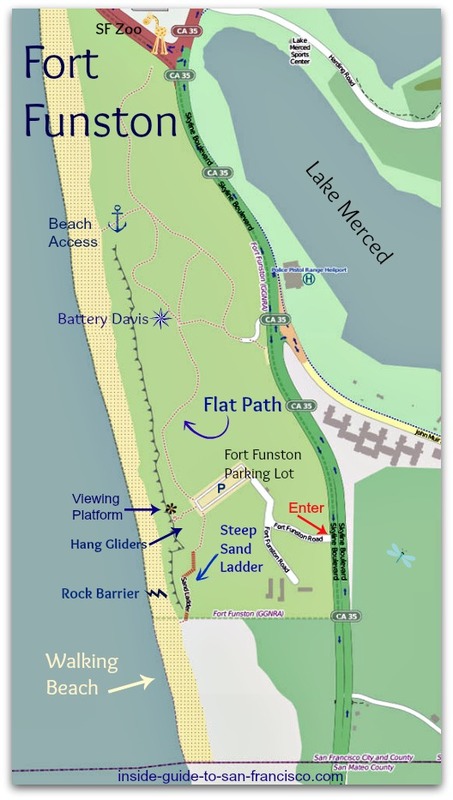 Or visit the wild and wonderful Fort Funston beach; walk along the cliffs or climb down to the sandy beach. 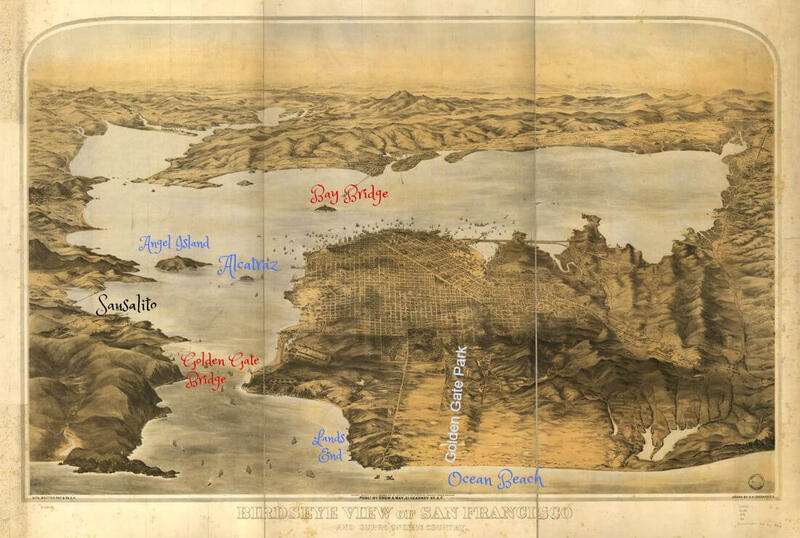 The very beginnings of San Francisco, before the Gold Rush in 1849. Portsmouth Square is now the center of Chinatown. 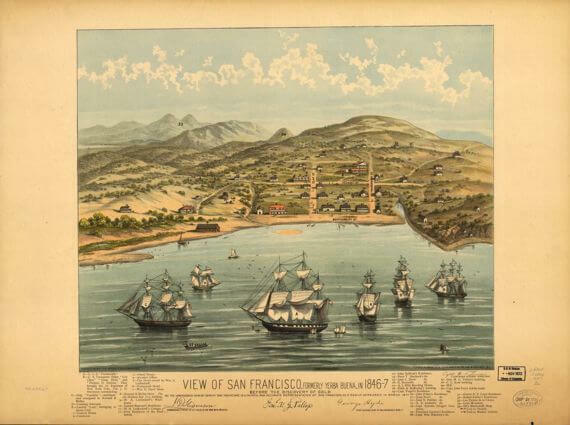 Bird's Eye View of San Francisco in 1876. 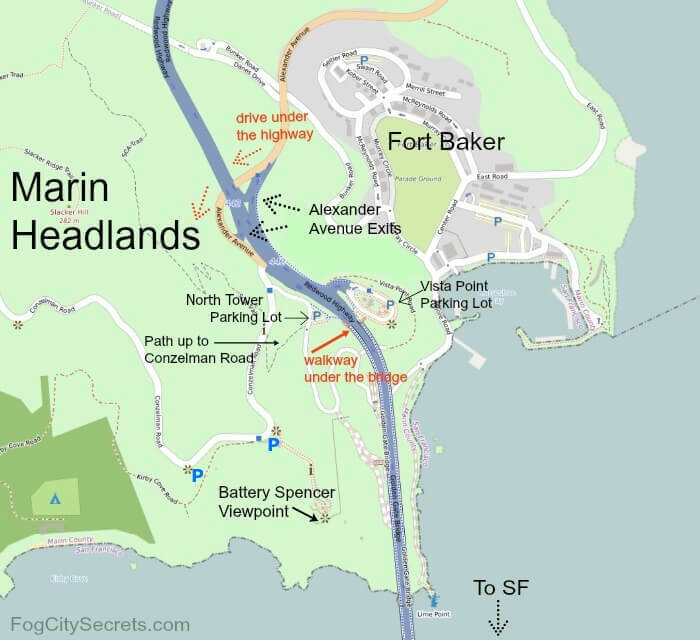 This is an early map of SF, before the bridges were built. The western lands were still sand dunes, but the downtown street grid is visible.